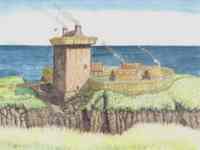 Dunbeath Castle is still occupied and stands on a rocky peninsula. The first recorded owner of the castle was Alexander Sutherland whose daughter Marjory was the second wife of the first earl of the Sinclair family. The castle was attacked in 1650 by Montrose. The castle was defended by Lady Sinclair as her husband was away. Unfortunately for her the castle was captured. It was held by Montrose until he was defeated at Carbisdale in Sutherland.